Tomatoes. Me and Tomatoes go way back. I used to HATE tomatoes. Well, I should clarify; I used to hate raw tomatoes. I liked canned tomatoes, spaghetti sauce, ketchup, basically any tomato in its cooked form but if it was raw, or if it tasted anything like a raw tomato, I thought it was horrible. Fast forward about 25 years and you have a gal who actually likes tomatoes. And I still like ’em. Especially fried green tomatoes. Yum. 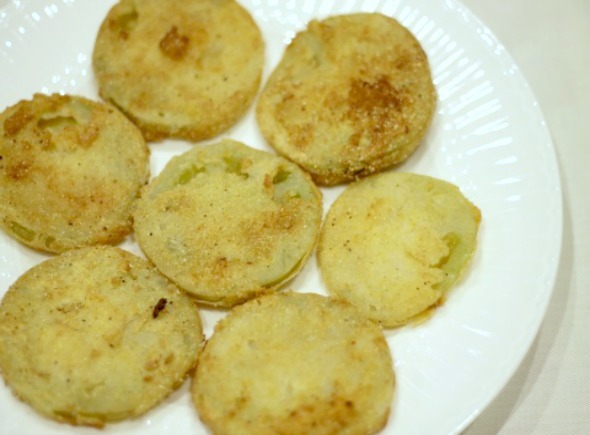 Tangy green tomatoes coated in a cornmeal batter and fried until crispy. Now that’s a grand snack or appetizer right there. I don’t eat fried green tomatoes often enough. One reason is that most restaurants don’t serve them and I just can’t find them that often. But on Sunday I stopped at a little vegetable stand and they actually had green tomatoes. My day was made. I bought three and I fried them up that very same night. My boyfriend and I enjoyed these little gems. And do you want to know a secret? This was actually the first time I had ever made them. I had always eaten them when someone else had made them. I know, a gal from the south who likes to cook but never cooked up a batch of fried green tomatoes. It’s almost a crime! Anyways, I hope you enjoy this recipe. Oh and if you’re a fan of ranch dressing like I am, then you’ll love these babies dipped in it. I based my recipe off of this recipe. 3 medium green tomatoes. Make sure they are firm or you will end up with soggy tomatoes. Cast iron skillet. If you don’t have a cast iron skillet, use another deep skillet. Slice the tomatoes about 1/4 inch thick. In one bowl, combine the seasoned salt, cornmeal and 1/4 C of the flour. In another bowl, combine the milk and beaten egg. Place the remaining 1/4 C flour in the remaining bowl. Coat each tomato slice in the flour, egg/milk mixture and then cornmeal mixture. Fry for about 2 minutes. If your oil isn’t deep enough to totally cover the tomatoes, flip after about a minute or after the bottom side is golden. I love fried green tomatoes! I haven’t had them in so long, and I’ve never made them myself! I think it would be really fun to try! I LOVE tomatoes! I’ll definitely try this recipe. Thanks for sharing! 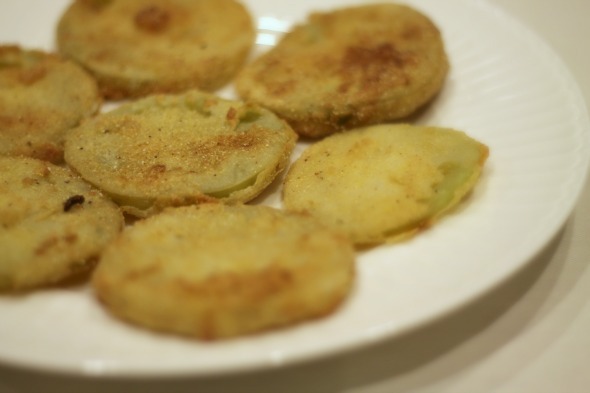 I have always wanted to try fried green tomatoes! Thanks for the recipe! Newest follower from GYB Hop. Would love for you to follow back at toddlindsey.com!